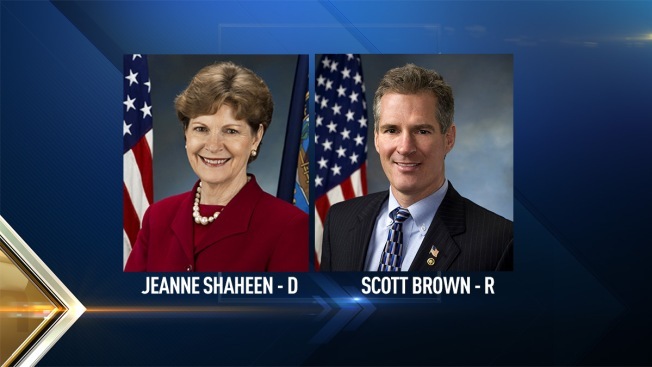 The most recent University of New Hampshire Granite State Poll puts Democratic incumbent Jeanne Shaheen ahead of her Republican challenger Scott Brown, but many political analysts say the race for U.S. Senate is a toss up. "It's just hard to tell," Southern New Hampshire University civics scholar Dean Spiliotis said. "If this feels like a gloomy day for Democrats and they stay home, Brown has a reasonable chance of winning the race." Brown has spent the past several days with gubernatorial candidate Walt Havenstein, putting nearly 600 miles on the "Victory for New Hampshire" tour bus. Monday, they stopped at MacKenna's Restaurant in New London, where Brown thanked supporters and worked to turn undecided voters in his favor. "If you're not happy with the direction we're going, we need to change senators," Brown said. "We need to make Harry Reid the Majority Leader and we need to reestablish who we are as Americans." Shaheen was also crisscrossing the state. NECN caught up with her at a bookstore in Concord. "We knew the polls were going to be up and down but the most important thing is that people go to vote tomorrow, they know what's at stake in this election," Shaheen said before walking into a room filled with supporters chanting her name. What's at stake is control of the United States Senate. Spiliotis said out of the 10 senate seats up for grabs across the nation, Shaheen's was one of the least vulnerable. But Spiliotis said as undecided voters make up their minds in these final hours before polls open, the tide could be changing. "If she loses the seat and it is called early on Tuesday night, that signals real national trouble for Democrats," Spiliotis explained. "Most of the other seats and west which are more hospitable for Republicans." Spiliotis said voter turnout isn't expected to be much more than 50 percent in the Granite State on Tuesday. Brown and Shaheen are doing everything they can to change that. "It is critical because whoever votes, wins," Shaheen said. Both candidates will vote early on Tuesday morning and then spend the rest of the day making stops at polling places throughout the state.